Britain announced Wednesday it will expel 23 Russian diplomats — the biggest such expulsion since the Cold War — and break off high-level contacts with the Kremlin over the nerve-agent attack on a former spy and his daughter in an English town. Prime Minister Theresa May told lawmakers that the 23 diplomats, who have been identified as undeclared intelligence officers, have a week to leave. She announced a range of economic and diplomatic measures, including the suspension of high-level bilateral contacts with Russia. An invitation for Russian Foreign Minister Sergey Lavrov to visit Britain has been canceled, and May said British ministers and royals will not attend the soccer World Cup in Russia this summer. May also said Britain would clamp down on murky Russian money and strengthen its powers to impose sanctions on abusers of human rights. "We will freeze Russian state assets wherever we have the evidence that they may be used to threaten the life or property of U.K. nationals or residents," May said, without giving details. May announced the measures after Moscow ignored a midnight deadline to explain how a nerve agent developed by the Soviet Union was used against Sergei and Yulia Skripal. 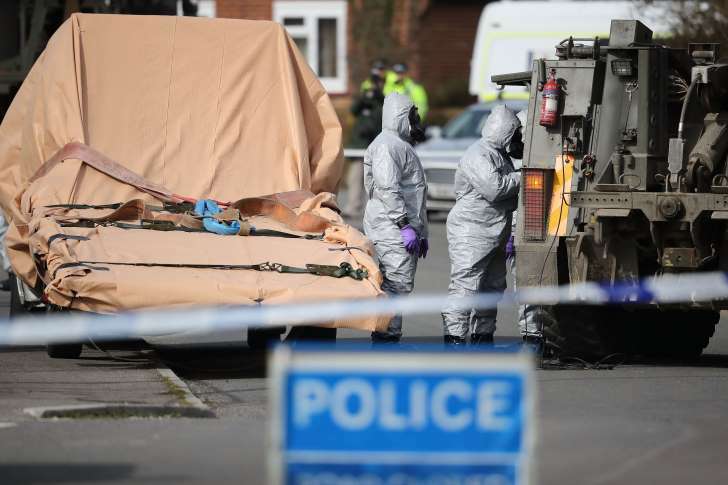 The father and daughter remain in critical condition in a hospital in Salisbury, southwestern England. May accused Moscow of reacting with "disdain" to Britain's request for an explanation and said Russia's actions were "an unlawful use of force by the Russian state against the United Kingdom." "It is an affront to the prohibition on the use of chemical weapons," May said. "And it is an affront to the rules-based system on which we and our international partners depend." Russia's ambassador in London, Alexander Yakovenko, said Britain's actions were "absolutely unacceptable" and "a provocation." Moscow has refused to comply with Britain's demands unless the government provided samples of the poison collected by investigators. President Vladimir Putin spokesman Dmitry Peskov told reporters on Wednesday that Russia "rejects the language of ultimatums." Peskov said Britain has so far only offered "baseless accusations which are not backed up by any evidence." He said Russia would cooperate with the investigation but does not see Britain's willingness to reciprocate. "We hope reason will prevail and other countries will think hard how serious the evidence against Russia is," he said. Russia has claimed that the nerve agent could have come from another former Soviet country, pointing to Moscow's foe, Ukraine. Lawmaker Vladimir Gutenev, a member of the state commission for chemical disarmament, said Russia had scrapped its stockpile of Novichok, the nerve agent used against the Skripals. "It is hard to say what may be happening in neighboring countries," he was quoted as saying by the Interfax news agency. Britain has sought support from allies in the European Union and NATO, including the United States. May's office says President Donald Trump told the prime minister the U.S. was "with the U.K. all the way." On Wednesday it also called for an urgent meeting of the U.N. Security Council to discuss the investigation. European Council President Donald Tusk said Wednesday that the attack was "most likely" inspired by Moscow and announced he would put the issue on the agenda at an EU leaders' summit next week. Vladimir Isachenkov in Moscow and Raf Casert in Brussels contributed to this story.